Prevailing wisdom holds that the ultra-poor are too poor to save money. 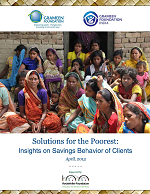 This study examines the savings behavior of ultra-poor women served by the Livelihood Pathways for the Poorest project, which is jointly implemented by Grameen Foundation and the Livelihood School (part of BASIX group of companies), in Gaya District, Bihar, India. The project is developing a model that could help the ultra-poor escape poverty through the provision of integrated financial, livelihood and risk management services.